Editor’s Note: You can have the opportunity to join John on our bonus Birdathon trip Field Photography with the Napa Ospreys. Find out more here. If you are interested in learning more about the Birds of the Sierra, there are still spots available in our upcoming class. Go to goldengateaudubon.org/education/classes/ for more information. At the end of February I was fortunate enough to lead a GGAS Photo Workshop to California’s beautiful Sierra Valley. It was a little different than some GGAS trips as the focus was on photography as well as birding. Raptors was the name of the game this time of the year. 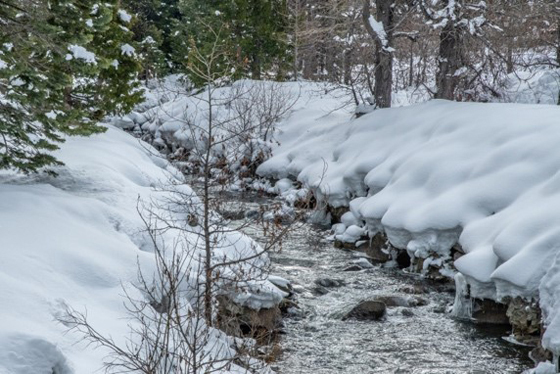 The Sierra Valley is located north of I-80 and west of Lake Tahoe; a beautiful agricultural Valley surrounded by the Sierra mountains near the small town of Sierraville. With the possibility of bad winter weather and hazardous driving conditions in February, we were careful to keep an eye on the weather and were pleased that it looked good enough to go. We were able to book reasonably priced rooms for all six of us, at the Canyon Ranch Resort, a quaint group of rustic cabins on a picturesque stream in the woods. It was perfect. Day One: We met in the hotel living room Saturday morning. We got to know everyone and had an hour to chat informally about photography and answer some questions both creative and technical. Good group dynamics are always important and are directly proportionate to the trip’s success and we had a great group. A couple of excellent birders, a medical researcher, a filmmaker and a teacher. Off we went, car pooling to make the trip and stopping along the way manageable. At the end of town behind a feed store was a large group of birds feeding so we stopped and got our feet wet shooting them. 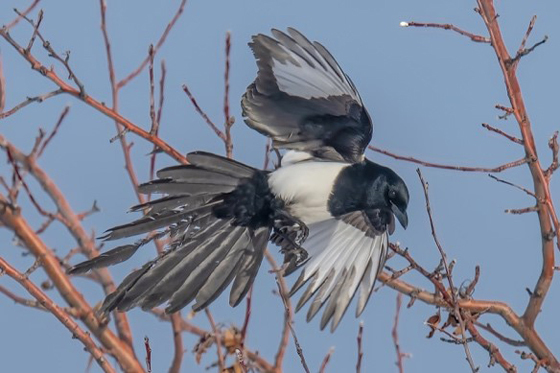 Highlights were perched and flying Black-billed Magpies, Cassin’s Finches, Dark-eyed Juncos, a Red-tailed Hawk perched high in a pine tree and various Sparrows. It was fun and we all got to adjust our camera settings and get the feel of the light and snowy backgrounds we would deal with all day. 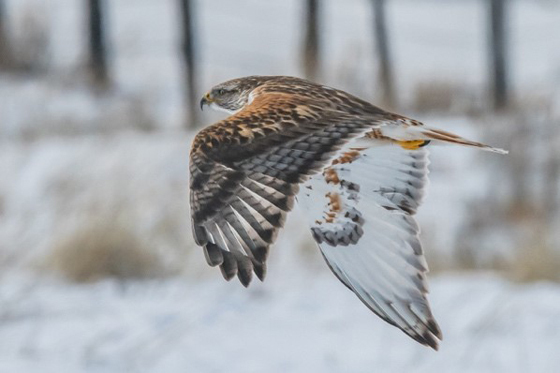 Our target area was about twenty miles away, a series of farm roads and agricultural fields covered in snow that are known for an abundance of raptors. 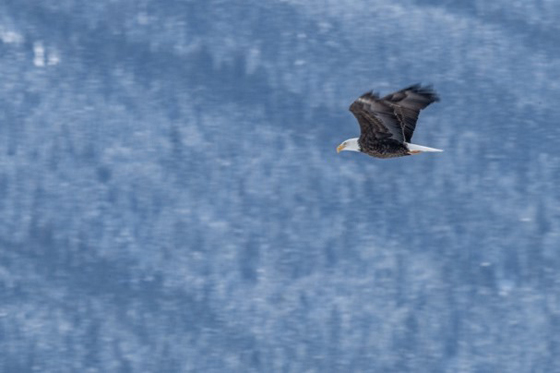 On the way we saw a pair of Bald Eagles, one perched and one in flight, which is always a thrill. The rest of the day was spent driving the area, looking for whatever wildlife encounters nature would provide. 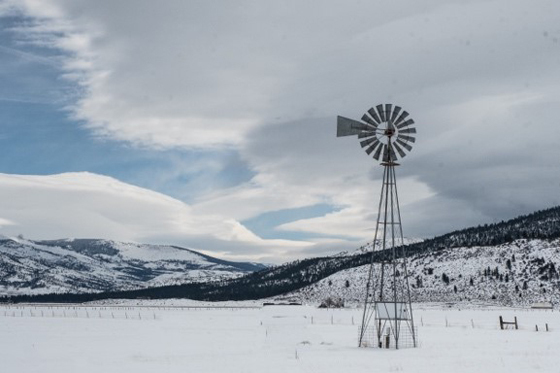 We also took the time to avail ourselves of the beautiful snow covered vistas and take some landscape shots. 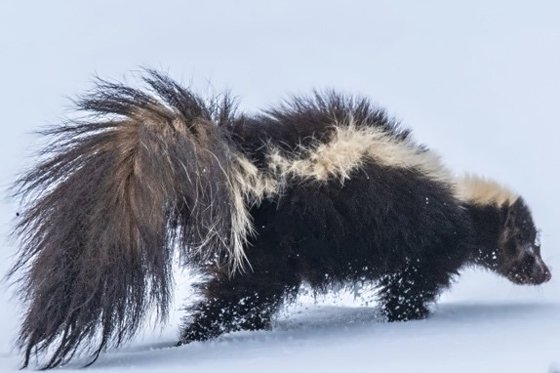 Highlights of day one were Red-Tailed Hawks, Rough-legged Hawks, a large group of Cackling Geese resting and foraging on their way north to their arctic breeding grounds, a Skunk and Coyote. After a long day in the brisk outdoors, as luck would have had it, there was a highly recommended family owned Mexican restaurant ‘Dos Hermanos,’ in Sierraville. The plan was to go back to our cabins, download our photos and have a working dinner together. We shared our work, talked about the day and the food was excellent. Along with an adult beverage or two, a good time was had by all. It was an early night for the tired group with another big day coming up. Day Two: Some sun and an impending snowstorm that evening meant an early start. It turned out to be a really good day. There were more raptors out and about, Red-Tailed Hawks, many Rough-legged Hawks, a couple of Bald Eagles and a bonus surprise, a number of late season Ferruginous Hawks. With clouds building in the distance we also took the time for some more landscape shots. We saw many more coyotes hunting in the snow; the awesomeness of nature was on full display. 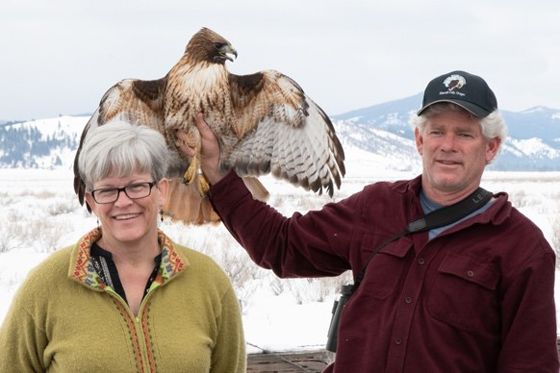 An unexpected highlight was seeing the release of a Red-tailed Hawk by two volunteers with the Plumas County Audubon Society. We decided to quit at about 4PM to beat the weather back to the Bay Area, getting together at a small country café for a hot meal, coffee, some laughs and goodbyes. I believe a good time was had by all, enjoying photographing wildlife in nature, learning a little from one another and making new friends.